The Journal of William R. Beebe features creative, art related writings by the artist. Click the RSS button to get automatic updates sent to you when Bill writes in the journal. An African Safari and Birding Expedition on a Budget ~ The NC Zoo! When my sister mentioned that the Zoo had a very nice Aviary, my ears perked up. It was her birthday, she loves the Zoo, and as you all know I love birds, so we decided to make the one and a half hour drive from her home. On our way to the R. J. Reynolds Aviary at the NC Zoo we stopped to tour the enclosed Sonora Desert reptile and bird domed facility, where we came across the Burrowing Owl. He was so captivating it was hard to move on. Next, we entered the magnificent, glassed domed Aviary, full of tropical plants, many of which were in bloom. As you enter there is a paved path that winds its way down several levels to the ground floor. Exotic birds, most of which I had never seen before, were flying freely! Light filtered down from the glassed dome, highlighting plants and birds, creating a dramatic setting for these colorful birds. It was a photographic field day and a challenging test for quick manual setting adjustments due to the strong lights and darks. I could have spent a week waiting for each species to land on the perfect perch. The tropical plants, light, and color offered up a photographic bonanza. Given enough time one could take pictures that might take years to capture in the wilds. We moved on, following the paved path, in search of lions and tigers and bears. It was getting late in the day, having spent so much time in the Aviary. When we arrived at the Lion station, the whole family was active. 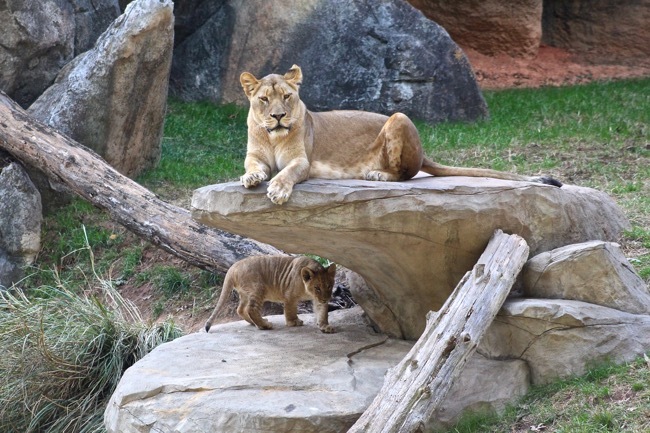 Four cubs were playing in the grassy field; big Daddy was lounging and stretching on a fallen tree, and Momma Lion walked up on a rocky ledge in order to supervise her cubs. I thought they looked unusually happy and active for zoo animals. On our way to see the Gorillas we spotted the Giraffes running through an open field. The golden hour light was hitting the long-necked animals as they pranced around like show ponies. When we arrived at the Gorilla station, crowds were gathered. Three young gorillas were wrestling like little boys. It was hard to get a good look over the onlookers’ shoulders. We moved on to another vantage point and as luck would have it the Gorillas made their way over to us! They were fascinating to watch through the glass partition, so human-like. Finally, we saw a large Elephant with its trunk swaying back and forth in synch with its front feet in a rhythm we found curious. As an artist, the Zoo is an invaluable resource for access to a wide variety of animals in close proximity. Zoos have always made me a little sad, seeing wild animals in captivity. Seeing the North Carolina Zoo with its extensive natural habitats and lively animals, helped change my perception. Hopefully, a Zoo like this one will inspire in many a love for animals and create a desire to help save their natural habitats. I hope you enjoyed seeing these photographs. I sure enjoyed taking them. Thank you as always for following my art, my photographs, and my journal. William R. Beebe is an accomplished realist specializing in painting ships, landscapes and bird life. The Watchful Guardian ~ a female Great Blue Heron on high alert! Night Vision ~ alone in the night! The Standout ~ A Brown Pelican with Creek Cred! Chasing the Elusive Belted Kingfisher ~ patience is a virtue! The Bystander ~ Young and Impressionable! Striking a Pose ~ Portrait of a Brown Pelican! Portrait of a Young Great Blue Heron ~ Creating a Likeness! Painting the Blues ~ alone and feeling blue? The Great One ~ Portrait of a Great Blue Heron! Henry the Great ~ Shem Creek’s Very Own Great Egret! Lowcountry Evening Light ~ Low Horizons Lead to Big Skies! The Black-crowned Night Herons of White Point Gardens ~ Graduating Class of 2018! Shem Creek Waterfront ~ Mount Pleasant’s connection to the sea! Next Stop Aaron’s Deli ~ Charleston Americana! Sundown on the Marsh ~ mixing up the palette! Lowcountry Reflections ~ big picture, small painting! The Many Colors of Shem Creek ~ the Jewel of Mount Pleasant, SC! Birding at Huntington Beach State Park ~ worth the trip! Lowcountry Heron ~ feeling at home with the Spanish-moss! The Paintings of William R. Beebe~ Studio Located in Mt. Pleasant, SC 757.897.2990 bill@williamrbeebe.com Copyright ©2019, William R. Beebe. All rights reserved.